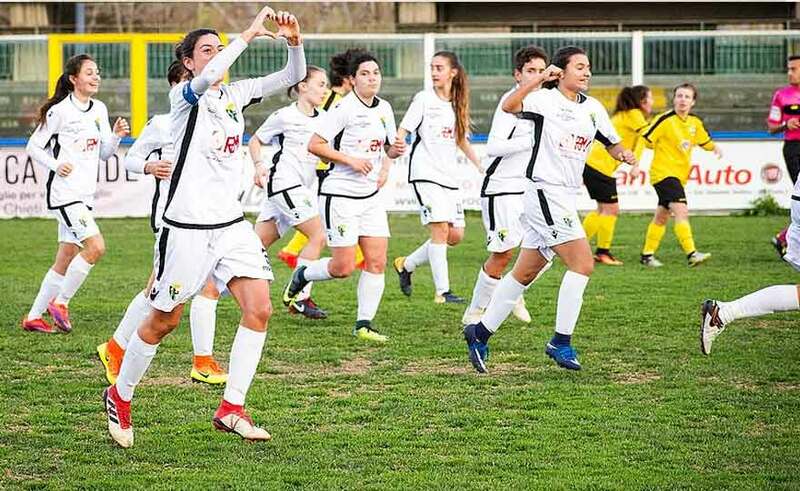 Giada Di Camillo: "Proud to be the captain of the Chieti Calcio Femminile"
The Chieti Calcio Femminile is growing strongly: in the last four games played two home wins (with Aprilia Racing and Vapa Napoli) and two draws away (with Sant'Egidio and Apulia Trani). A match to be recovered in Potenza and a ranking that sees the neroverdi to 12 points. Next Sunday is the derby to play in Pescara: a difficult match, but certainly different from those played in the past few months in the cup and championship that saw the success of the biancazzurre on both occasions. Chieti now lives a great time and morale is high. The recovery of the injured players and the return of Vukcevic, an indispensable bomber for the team, has greatly benefited. The captain Giada Di Camillo is constantly among the best in the field and during this season he often took his girlfriends by putting their experience at their service allowing to overcome even some moments undoubtedly difficult after some sometimes heavy defeats. "We have started to achieve fairly continuous results, which has benefited the team. We have thus started to reap the rewards of all the work done in recent months and the environment is therefore more serene than it was before. We hope to continue on this line and not make unexpected missteps. I would like to say that the games have the same weight: we are expecting two, against Pescara and Salento, which in my opinion are more within our reach because then we will have Napoli, Ludos Palermo and Grifone Gialloverde who are still those who are fighting for the upper floors. It will therefore be important to make more points now even if I can not rule out that we can do them even against the former, but you will need that extra bit of force ". "The team's performance has been positive in recent times, but at the same time I always like to fly very low. A little 'all we are gaining more awareness in the potential of the team: the more we play quiet and convinced of our possibilities and the more we can do what we want to do. If you take a goal and get down, if you start a game with fear on it is difficult to bring home a good result. Lately we enter the field quiet, we express all the desire we have inside and, thanks to the great respect, strength and confidence that is giving us the coach, we can give the best Sunday after Sunday ". "The tranquility and awareness do a lot, but we also regained an absolutely important element of the team, Marija Vukcevic - admits Giada Di Camillo - that in the field is giving us a great hand and is a reference point for the smallest and for us more big is a support. He is a positive person even outside the field. He has raced important football stages and dressed in prestigious jerseys, is the captain of his national team: he is making big sacrifices to be there and always wear the neroverde shirt because, for the championship that we dispute, not always the commitments of his national coincide with our breaks. His return was fundamental ". "The derby is always the derby: on both sides there will be a different atmosphere between the girls and I think there will be a beautiful audience, it will be a good show. We have prepared as usual: the team has trained at its best, we are focused and we know that the match is important to continue the positive result, we are interested in making points to move the ranking in our favor. Personally as captain I am aware that the derby is very felt between the two cities: we will try to honor the shirt as we have always done and play all ninety minutes at most ". "I am extremely proud of the captain's band because I know I earned it with the sacrifices over time and with the love I swore to these colors. I've always been there for good or bad. The fact of being a captain fills my heart. I'm trying to give it all Sunday after Sunday: I finally scored the first goal of the season against Vapa and I dedicated it to the team and to my sister since it's the first year I've been playing for so long without her in my side. I knew he was in the stands and I ran towards her. I'm happy with my season so far, I hope to continue like this and do even better in this second round. I hope this vintage will serve us to lay the foundations for a good future "